In this article, we review that subject of – how to create a Hash table + Custom expressions as a “tool” that we can use for optimizing and manipulating the PowerShell output in scenarios of – Get information about recipient’s E-mail addresses. Get information about specific types of E-mail address such as – Primary E-mail address, Proxy E-mail address, x500 E-mail address and SIP E-address. Remove the default SMTP prefix from the displayed results of smtp E-mail addresses. What is the purpose of using Hash table and Custom expressions? The PowerShell option which describes as – “Hash table“, is a very powerful option, that enables us to create a “NEW property” that is customized to our specific needs. The custom property can be implemented in various ways, such as – calculated field, search query and so on. For example, the PowerShell command Get-Mailbox, can be used for displaying the information stored in the “EmailAddresses” property. The “EmailAddresses” property includes a “list,” of all the available “address” that specific Exchange recipient has. By default, the PowerShell command Get-Mailbox doesn’t include a built-in parameter that enables us to “filter the search results,” and asks to get information only a specific type of E-mail address such as Proxy E-mail addresses. The good news is, that by using the option of – PowerShell “Hash table,” we can create a “NEW recipient property,” that will include the specific information that we need. In our case, all the Proxy E-mail addresses of a recipient. The creation of this “NEW recipient property” is implemented by “Hash table”. This is the first part of the Hash table, in which we define the “Name” of the custom property. The “Name” is just an arbitrary name whom we define. Part 2#2 – The Expression part. The term “Expression,” can be translated into various types of “PowerShell sentences” such as – a Filtered search query, calculated value and so on. There are two options of naming conviction that we can use for the writing Hash table. “Extract” Proxy E-mail address using “Hash table” example. To demonstrate the way that we use Hash table (custom property), let’s use the following example: we want to display information about the Proxy E-mail address of the recipient. Part A – this is a standard PowerShell “Get-Mailbox” command, in which we ask from PowerShell, to get all the available information about the Exchange Online recipient mailbox. Part B – In this part, we use the PowerShell parameter “select” for displaying only two properties of the recipients: the standard “DispalyName” property + NEW custom property that we define by using a Hash table. Number 1 – we use the “@” character, for “declaring” that we create a special array (Hash table) that includes the Array name + PowerShell expression such as filtered search query, calculated value and so on. And again, this is just an arbitrary name whom I choose for my specific needs. We instruct PowerShell to query a recipient property named – “EmailAddresses”. A quick reminder – this is the mailbox property, that store information about every existing E-mail address and other address. Number 4 – we define a filter that will fetch information only about Proxy E-mail addresses. Exchange stores information about smtp E-mail address by using the “smtp:” prefix. Proxy E-mail addresses are represented by the “smtp:” prefix written in small caps. Primary E-mail address represented by the “SMTP:” prefix written in capital letters. The condition that we define is actually based on two separated condition. 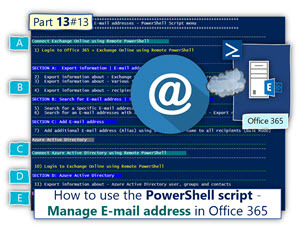 We ask from PowerShell, to “fetch” information only about E-mail address that starts with the prefix – “smtp:” and in addition, the smtp prefix must be written in small caps. To fulfill this requirement, we use the PowerShell logical operator – “cmatch”. PowerShell logical operator – “cmatch” was created for looking for a “perfect match” + performing a case-sensitive match. Enhance our capability to create a custom\ new recipient property that will enable us to view information about specific types of E-mail address such as – Proxy E-mail address, SIP address, x500 E-mail and so on. Adding “separation character,” that will enable us to work better with mailbox attribute that defined as multivalued attribute that contain multiple E-mail addresses. In the former section, we review the way to create a PowerShell Hash table that “filter” the search result by displaying information about E-mail addresses that have a specific character such as Proxy E-mail addresses. In the following diagram, we can see the “output” that we got from the PowerShell command. When Exchange Online recipient has more than one Proxy E-mail address, PowerShell will display the information using a curly bracket. In many scenarios in which we need to “work” with the “E-mail address information”, we will need to remove the curly bracket characters. When PowerShell “see” more than one E-mail address, PowerShell will use the comma (,) character for separating between the values (E-mail addresses in our case). The “thing” is that when we export the information to a file such as a CSV file, PowerShell will not use the comma (,) character, but instead, will use a “space” to separate the values. In case that we need to “manipulate” the data stored in a CSV, we need to use some “separation character,” that will enable us to address separately each value. PowerShell displays each E-mail address using a prefix, that defines the type of the E-mail address. In our example, each proxy E-mail address will be displayed using the prefix “smtp:” using small caps. In case that we need to “do something” with the information about the “E-mail address,” we need to use the “clean” from the E-mail address the “smtp:” prefix. Optimize the output of the Hash table using the parameters- Replace + Join. In the next section, we will add the additional parameter to the PowerShell Hash table, that will help us to improve the output of the Hash table. In the following diagram, we can see the additional parameters that were added to the “original syntax” of the Hash table. We will start with the mission of – removing the “smtp prefix,” from the information that is displayed about the Proxy E-mail addresses. In our example, we use the following syntax -replace ‘smtp:’. In the following box, we can see the result of the PowerShell output. In addition, we want to add a “separator character” that will separate each “E-mail address value” when we export the data to file such as CSV file. Removing the smtp prefix from the PowerShell output of the E-mail address. Removing the “curly bracket” the surround the E-mail address array. Each E-mail address appears without the smtp prefix. The “curly bracket” the surround the E-mail address array was removed. Each E-mail address is separated by the characters – (;). In the following section, I would like to review a couple of examples to a scenario in which we use PowerShell Hash table, for getting information about specific Exchange recipient E-mail addresses. The PowerShell command – Get-Mailbox, include a dedicated parameter that enables us to display information about a specific E-mail address that defines as – Primary E-mail address. In other words, we don’t need to implement any sophisticated PowerShell command syntax such as using the Hash table for a display Primary E-mail address. Although we don’t need to use a special command configuration, I would like to provide an example to the Hash table syntax, that we use displaying E-mail that defined as a Primary E-mail address. In this example, we define a condition using the “cmatch” logical operator, that “fetch” information about E-mail address only if the prefix of the E-mail address include the string “SMTP:” using capital letters. In the current scenario, we want to view information only about recipient address, which described as “SIP address” (addresses that are used by Skype for business users). In the current scenario, we want to view information only about E-mail address, which described as “x500 E-mail address”. In our scenario, we ask from PowerShell, to display information about each type of E-mail address such as – Primary E-mail address, Alias E-mail address, SIP address and so on. In addition, I add a new example of “custom result fields” (NEW property) that perform a calculation, in which we count the number of Proxy E-mail addresses that each Exchange recipient has. In this section, I would like to review additional “PowerShell method,” in which we “separate” values that appear in a multivalued attribute. As mentioned, the Exchange Online mailbox attributes “EmailAddresses” considered as a multivalued attribute, because it stores a couple of values meaning, a couple of (multiple) E-mail address. In the output, we can see that the “EmailAddresses” property includes many E-mail addresses. Each value (member) that is included in the Array (array member) is represented by index number begging with “0” and so on. To be able to address a specific Array member (specific E-mail address stored in the multivalued attribute “EmailAddresses”), we can define the specific index number that represents the member. for addressing the “first member” in the Array. for addressing the “second member” in the Array. In our scenario, we want to create a display that will “fetch” the Array members, and display each member separately. in our case, fetch each “E-mail address” stored in the multi valued attribute “EmailAddresses” and display the information about the E-mail address in a dedicated column. To implement this requirement, we define a custom information field (Hash Table), that includes a “dedicated column” for each E-mail address. name – E-mail address 01. In the second part (Expression part), we ask PowerShell to fetch for us the first value in the multivalued attribute “EmailAddresses”. The first value is represented by the index number . We add these syntax a couple of times, for each additional value that are included in the Array. Notice that we don’t know what is the number of the “values” in the attribute “EmailAddresses”. All we can do is just to “speculate” and define a dedicated custom information field (Hash Table) for each value (E-mail address). In the following section, I would like to review more examples of scenarios in which use the PowerShell Hash Table, and “Custom expressions” with a combination of PowerShell Where statement. We want to get information only about recipients whom their Primary E-mail address includes a specific domain name suffix. In our example, the domain name suffix that we look for is – o365pilot.com. The information about this Exchange recipient will include the recipient Display name, Primary E-mail address and his Proxy E-mail addresses. An additional variation of this case is a scenario in which we want to get information about Exchange Online recipients whom they Primary E-mail address includes a specific domain name suffix OR “other” domain name suffix.